The U.S. National Highway Safety Administration reports that men are responsible for causing approximately 6.1 million accidents per year, compared to only 4.4 million accidents caused by women. This statistic is true despite the fact that more women than men hold valid driver’s licenses. The University of Michigan’s Transportation Research Institute found in a study that 104.3 million men have a driver’s license, compared to 105.7 million women who have a driver’s license. 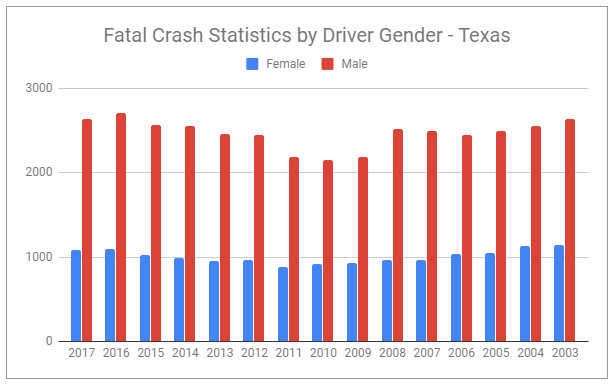 An examination of statistics on fatal motor vehicle accidents in Texas (see Chart 1), reveals staggering differences between the amount of accidents involving male drivers versus female drivers. In 2017, 71% of fatal Texas car crashes involved a male driver, compared to 29% of accidents involving a female driver. Interestingly, since 2003, accidents involving women have decreased slightly, while the rate of accidents involving men has fluctuated since 2003, with a slight overall increase since 2006. Overall, the difference in statistics on crashes by gender has held relatively consistent over time, with a deviation of no more than 1-4% since 2003. There are multiple factors that may contribute to the higher occurrence of accidents involving male drivers. According to the Federal Highway Administration, males drive an average of 6,400 more miles than females annually. In addition to their higher propensity to cause motor vehicle accidents, men are also more likely to commit DWI offenses, speed, violate traffic laws, and fail to wear a seat belt. While men are more likely to drive while intoxicated, in the last decade, the arrest rate of males for DWI has dropped by 7.5% and risen by 28.8% for women. These statistics may be attributable, in part, to metabolic differences between the sexes and the differing levels of impairment that result. Data compiled by the Center for Disease Control (CDC) indicates that Texas is slightly above the national average of individuals killed in a motor vehicle accident involving a drunk driver. The percentage of Texas drivers who report driving after consuming too much alcohol is also slightly higher than the national average—2.1% to 1.9%, respectively. During the period of time studied, 2003-2012, there were 13,138 deaths in Texas caused by an accident involving an intoxicated driver. Sobriety checkpoints, which allow the police to briefly stop drivers to check for signs of intoxication, are illegal under Texas law. In Texas, a DWI charge is a serious offense that holds potential penalties of jail time and significant fines, if convicted. First and second time offenses are classified as Class A misdemeanors. A first time DWI offender who is convicted of driving with a blood alcohol content (BAC) level of less than .15 may be sentenced to up to 180 days in jail and ordered to pay fines of up to $2,000. If you are convicted of driving with a BAC between 0.08 and 0.14, you may face up to a year in prison, $4,000 in fines, and be required to install an ignition interlock device on your vehicle. The NHTSA reports that in the context of fatal motor vehicle accidents, speeding was a factor in 24% of accidents caused by males and 15% of accidents caused by females. Exceeding the speed limit increases the likelihood that a driver will follow another vehicle in front of them too closely or be unable to stop for other vehicles, animals, or obstructions in the road. Speeding in poor weather conditions can further exacerbate this danger if a vehicle hydroplanes or is unable to stop when necessary. When a crash between two motor vehicles occurs, if one or more of the vehicles was driving over the speed limit, the damages caused by the impact are likely to be more severe, resulting in serious injuries and property damages. Statistically, men tend to wear seat belts less often than women, particularly if they are under the influence of drugs or alcohol. It is no secret that use of a seat belt dramatically decreases an individual’s risk of death and serious injury when they are involved in a motor vehicle accident. This factor is more relevant to injuries sustained than to the question of causation. If you or a loved one have been injured in a motor vehicle accident due to the negligence of another driver, contact the experienced and knowledgeable personal injury lawyers at Lowenberg Law Firm. We would be happy to discuss your options and examine the evidence in your case.